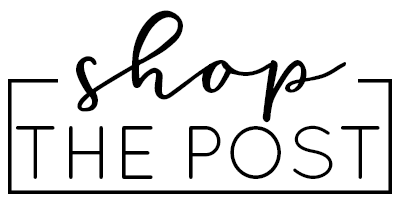 It’s the most wonderful time of the year… the Nordstrom Anniversary Sale! 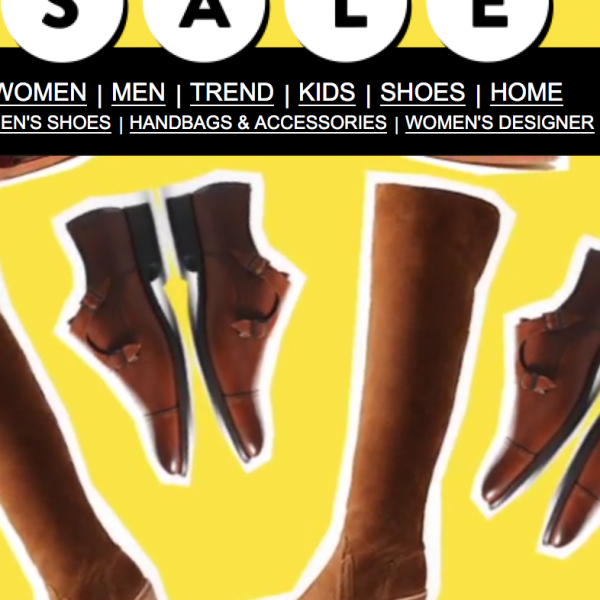 I’ve been anticipating this sale for months and picked out the hottest deals on the best, most versatile items just for you. This is THE sale of the year where you can stock up on high-quality wardrobe essentials for a fraction of the cost. 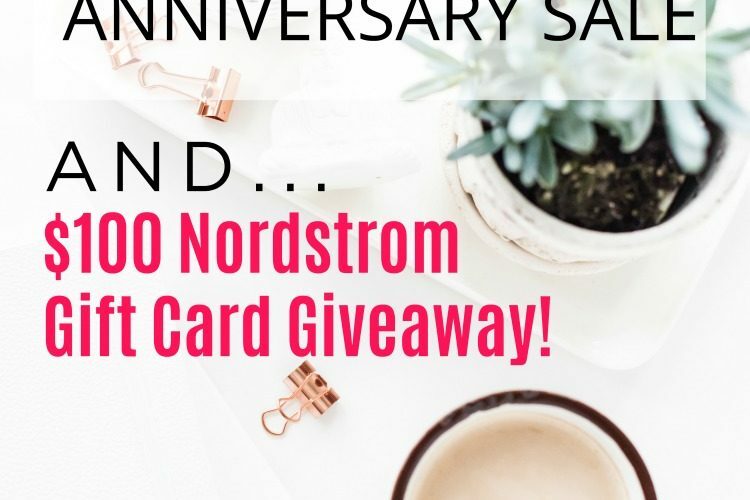 And because I love you so much, I’ve personally purchased a $100 gift card to Nordstrom to give away to a lucky reader. Keep reading to enter! Read yesterday’s post about how to Get Early Access to the Sale and get the most bang for your buck— but basically get the Nordstrom card, you won’t regret getting in early before all the good stuff is gone! 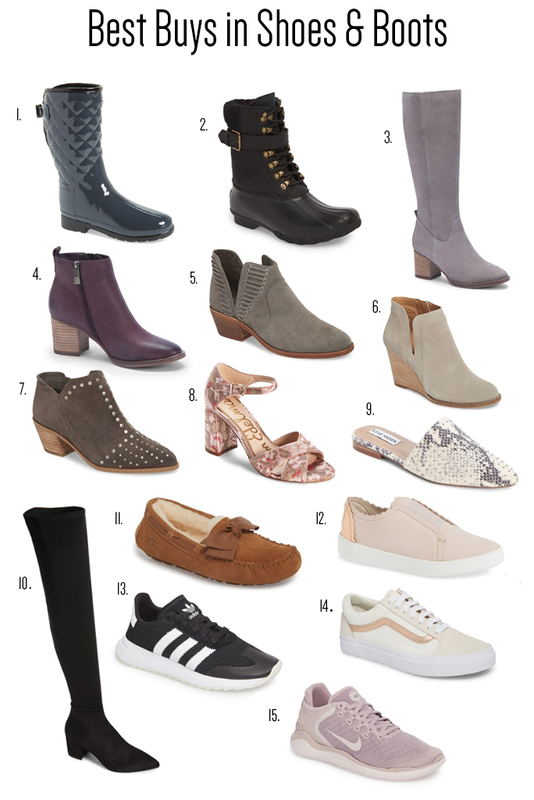 I’ve ordered a lot from this list (and already have some in my hands, stay tuned!) and will be sharing everything over on Instagram stories as soon as I get settled in Charleston where I’m attending the Haven conference. Nothing like a hotel try-on sesh with friends! And now, on to my favorites; I’ve sorted them by category to make shopping easy. I’ve also noted items that would make great gifts if you want to get some holiday shopping done early! 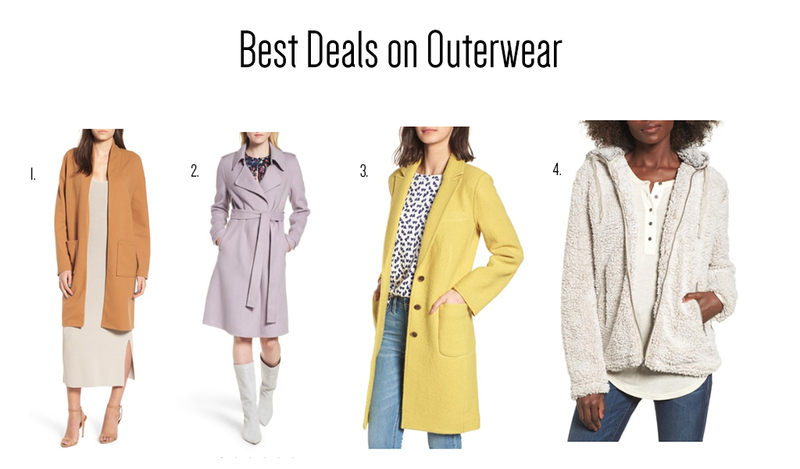 The Anniversary sale is a fantastic time to save on outerwear which is usually quite pricey; however these sale prices make the luxury brands much more affordable! 2. Bagdley Mishka wrap coat, $229.90 (after sale $349)– I’m getting this in camel but the lavender is lovely! 3. J. crew Olga coat, $184.90, (after sale $278)– comes in several gorgeous colors! I snagged the Halogen drape front jacket this AM and tried it on really quickly before heading out the door. 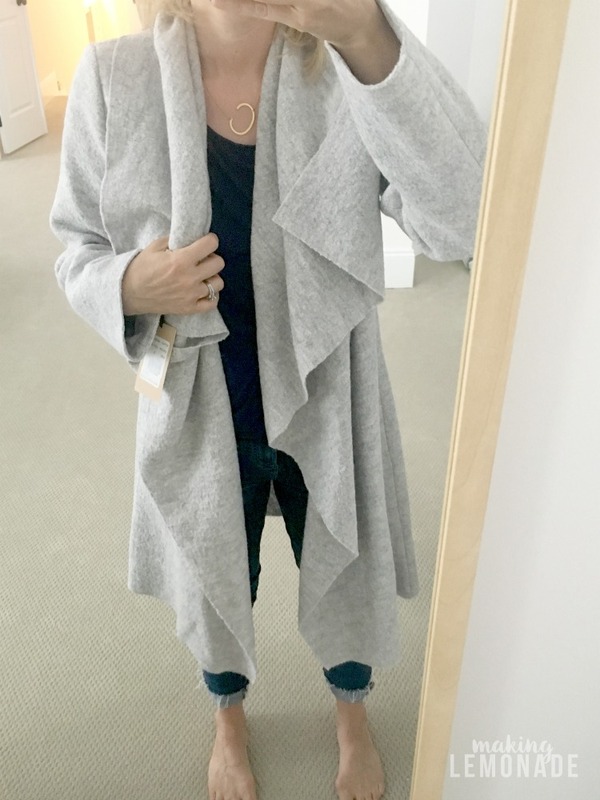 It’s on the bulkier side but I LOOOOOVE it, I hate wearing jackets in the winter so this is a great alternative because it’s warm and lined on the top but loose and drapey and non-constricting as well. So chic! 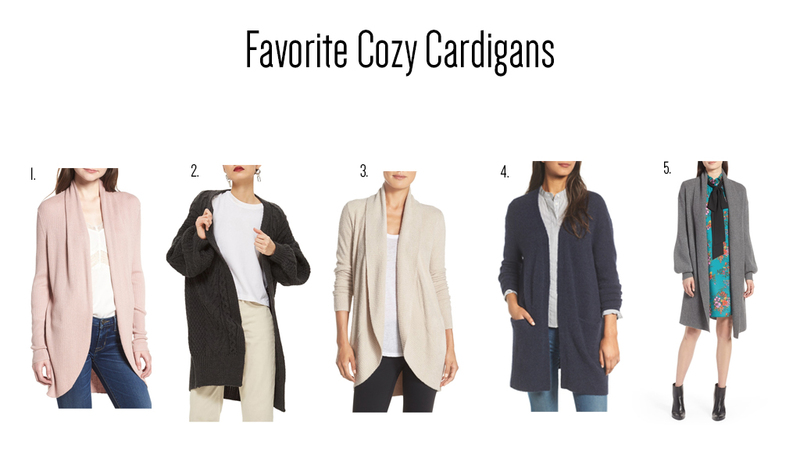 I buy a new open cardigan (or two) every year because they’re so darn irresistible and can be layered over anything. 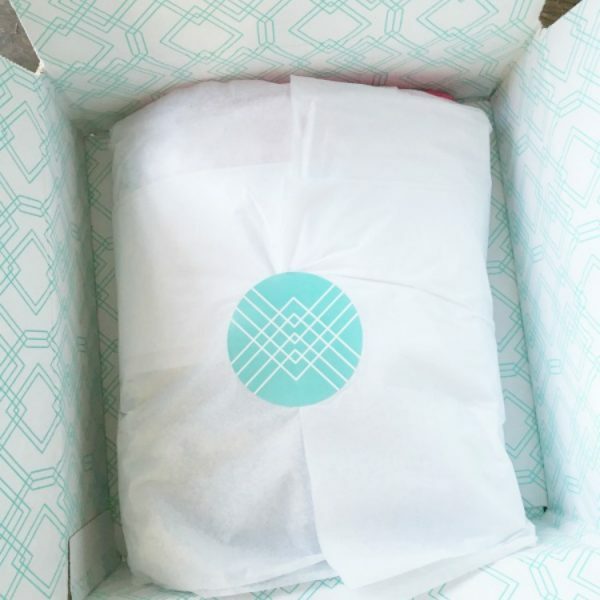 The Barefoot Dreams one was a HUGE seller last year and it’s BACK! Leith Circle Cardigan, $45.90 (after sale $45.90)– tons of cute colors, including blush pink! Barefoot Dreams Cozy Chic Cardigan, $88.90, (after sale $134)– Great GIFT IDEA for the women in your life, comes in plus sizes too! There didn’t seem to be as many tops in the lookbook as I was hoping for, but I’ll report back with additional finds. 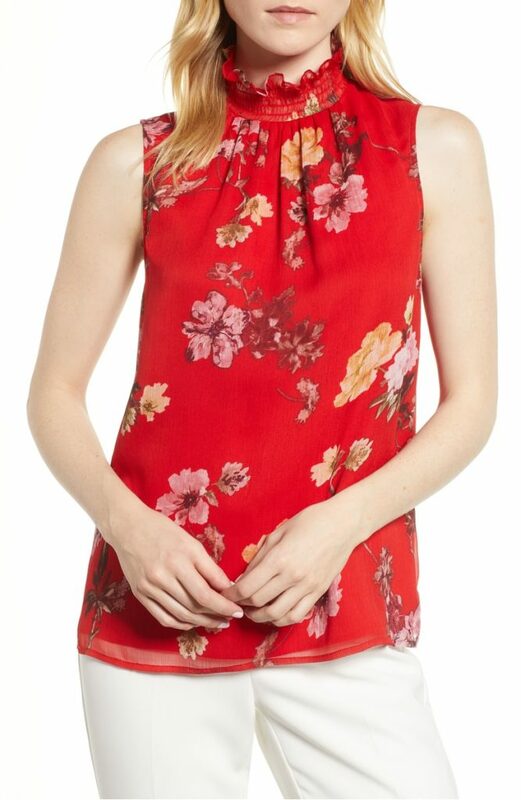 Vince Camuto Ruffled Neck Blouse, $58.90 (after sale $89)– several colors and patterns! 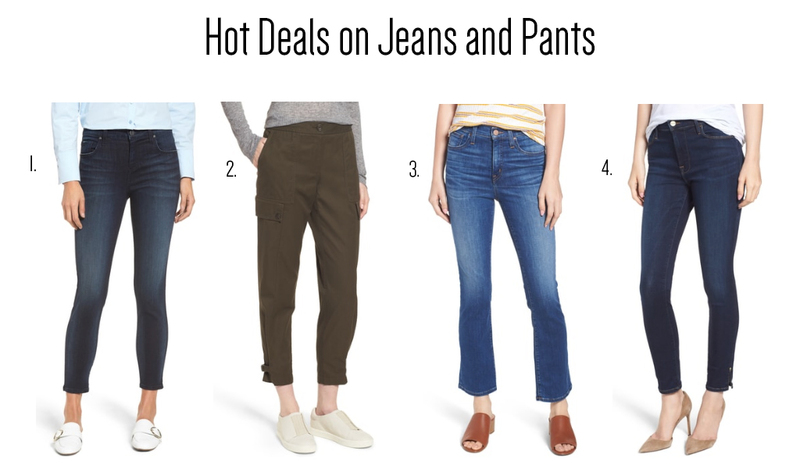 Now’s the time to get designer jeans on sale and update your wardrobe for a fraction of the normal price! 1. Kut from the Kloth Skinny Jeans, $59.90, (after sale $89.50)– everyone raves about this brand! 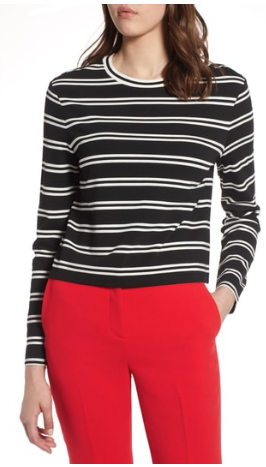 They also have my favorite pair of high-waisted Paige jeans that I bought at the sale last year, plus I know lots of people love these AG jeans and they’re expensive so now’s the time to scoop them up– you’ll save $75!!! 2. Sperry Shearwater Boot $109.90, (after sale $184.95) HOT DEAL on cozy winter books! Check out the savings! 3. Blondo Tall Boot, $159.90, (after sale $239.95)– another HOT DEAL, check out those savings! The heel is shorter and more manageable for walking so this is the pair I bought. 7. 1State Loka Studded Bootie, $99.90, (after sale 149.95)– I couldn’t resist these booties and got a pair myself! 8. Sam Edelman Orland Sandal, $79.90 (after sale $119.95)– I’m a huge Same Edelman fan and have several pairs of sandals from this brand; I adore them! Check out those pretty patterns! 9. Steve Madden Trace Studded Mules, $49.90 (after sale $79.95)– the snakeskin is a fantastic neutral pattern, these would look great with jeans, dresses, skirts, you name it. 11. UGG Dakota Bow Slipper, $79.90 (after sale 119.95)– GIFT IDEA alert! These cozy slippers would make someone very happy. 12. Cole Haan Brandpro Spectator Sneaker, $99 (after sale $150)– THESE ARE GORGEOUS! I got a pair this morning and the rose gold accent is just perfection! 14. VANS sneaker $42.90 (after sale $ 64.96)– GREAT PRICE for casual sneakers! Not pictured are the Sam Edelman Tall Boot, $149.90, (after sale $224.95), this is a HOT DEAL on tall boots, you save $75! They’re a little too tall of a heel for me but for those who can handle it, they’re a super great pair of boots. 1. Herschel Supply Co, Flight Satin Strand Duffel $52.90, (after sale $80)– GIFT ALERT! The price is perfection, I bought one for myself as a gym and overnight bag but might get a few for gifts as well. 2. 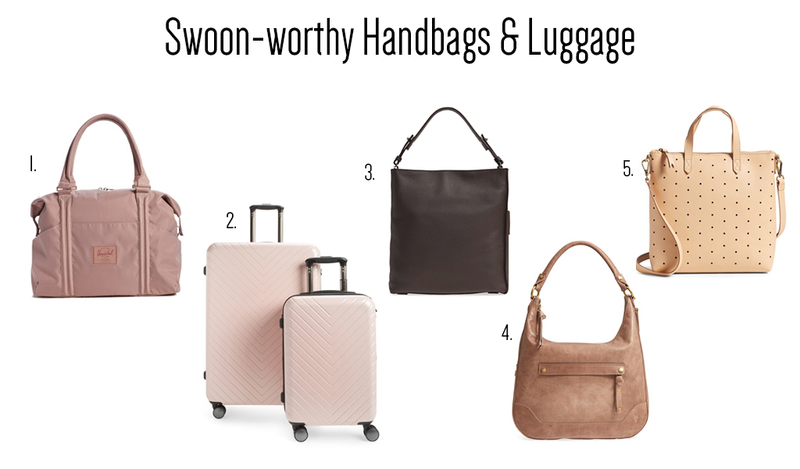 Nordstrom Luggage Set, $223.90 (regular price $408!) HOT DEAL and GIFT ALERT! This set comes with TWO suitcases making it a great price point. 3. Mast Shoulder Bag, $218.90 (after sale $328) HOT DEAL, you’re saving over $100! 4. Madewell Holepunch Crossbody, $109.90, (after sale $168)– HOT DEAL, you’re saving $60! 5. Frye Melissa Zip Hobo, $265, (after sale $398) HOT DEAL on pricey Frye bags— you save over $130! Not pictured is the Nordstrom Kara Expandable Crossbody, $98.90 (after sale $149)– Crossbody bags are my favorite because they take the pressure off my aching shoulders! 1. Sweaty Betty Dhahran Yoga Tee $49.90 (after sale $74)– I bought this in the pink, so pretty! 2. 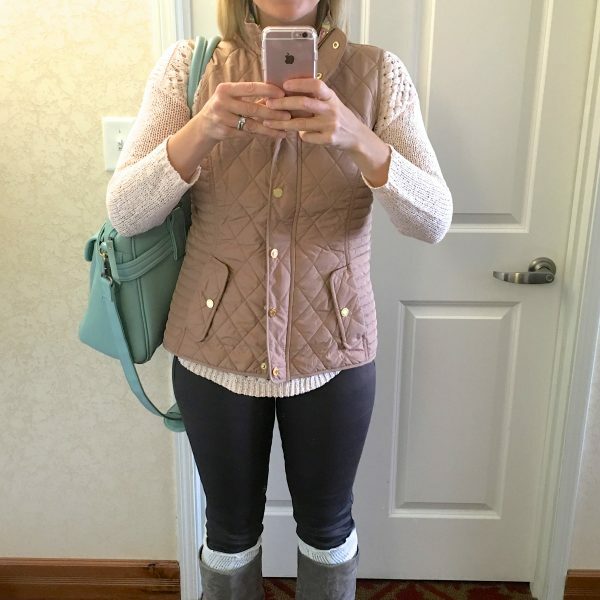 Zella high waist leggings $38.90 (after sale $59)– I bought these last year and added another pair to my shopping bag because I wear them ALL. THE. TIME. This is the wrong photo on the graphic but I’m running out the door and can’t change it; click through for the correct pair, sorry about that! 3. Zero Gravity Leggings $89.90 (after sale $135)– I pay more for leggings because they work hard on me. 🙂 These are adorable and match the top above. UGG Cassandra PJ set $48.90, (after sale $73)– GIFT IDEA for teens and the ladies on your list! 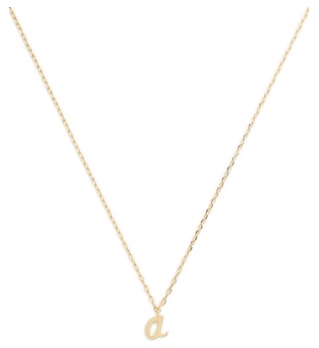 Kate Spade New York Initial necklace $31.90 (after sale $48)– GIFT IDEA for the ladies in your life! Moms, daughters, sisters, teachers, BFFs… who wouldn’t want one of these sweet initial necklaces? J. 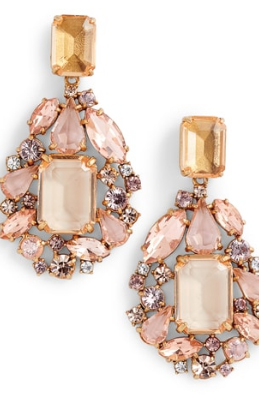 Crew Cluster Drop Earrings, $37.90 (after sale $58)– I’m all about statement earrings so I bought these, what a great price! When it comes to kids and the Anniversary sale, I focus on two areas: jackets and shoes. Here’s my favorite steals on kids shoes! 1.Tucker + Tate flat $29.90, (after sale $49.95)– GIFT IDEA for little girls! I can’t even with these adorable flats! Did you make your wish list and start shopping yet? Because I love you so much and appreciate all your support of my #awkwardselfies, I wanted to thank you for everything with a very special GIVEAWAY! 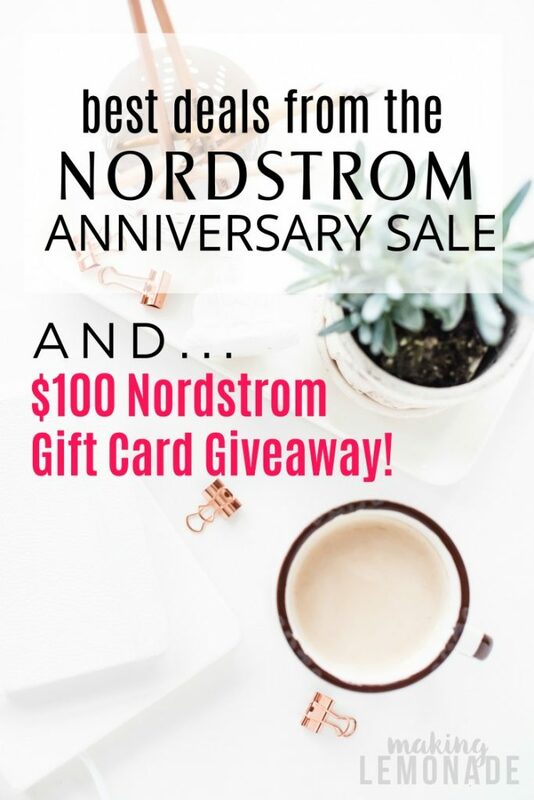 SHARE this post for a chance to win a $100 gift card to Nordstrom! Enter using the Rafflecopter widget below. Good luck, my friends! I’d love to hear about your favorites from the sale in the comments or over on Instagram too!